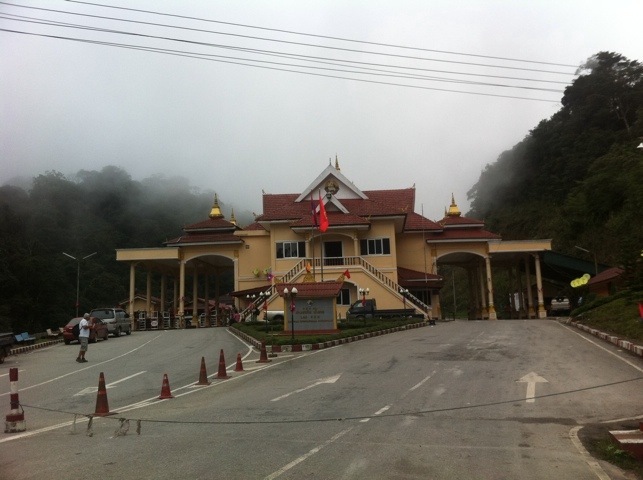 We took the sleeper bus to the northern town of Luang Prabang. Our departure was fairly typical of the laid back approach here. We were told to be at the hostel at 6pm for a bus leaving the town’s northern bus station at 7. Being new around here, we got there early. An hour later, at quarter to seven, our transport to take us to the bus station finally arrived – a Sawngthaew, converted pickup truck with a basic roof and two benches screwed to the floor. 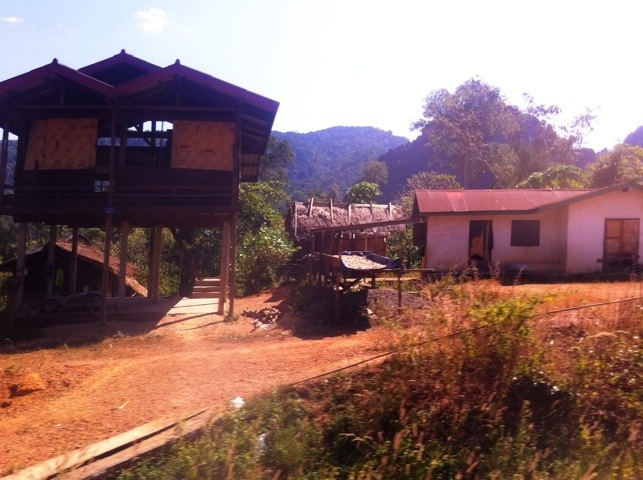 We were beginning worry about missing the imminent bus, but then we remembered – Laos time. Chill out! Our pickup spent the next thirty minutes spiralling through the streets of the tourist part of town collecting various other folks for the ride, each looking more panic stricken as 7pm came and then went. Pretty much full, we were certain this must be it, and we’d soon be finally off. We lurched round the corner, only to find the engine switched off, and ourselves one street away from where we’d started two hours before. The driver announced that we were waiting for two more passengers who were running late, and so we sat and waited. 7:30 came and went, and then the guy, looking increasingly worried himself, had a debate with the manager of the hostel we were parked outside, who then also came to assure us we were waiting for good reason – comically he told us the passengers holding us up weren’t even on our bus, instead heading south to Si Phan Don (we were going north, but it was from the same out-of-town bus station). At 7:45 two people finally showed up (it seemed they’d just casually gone out for a long dinner), piled into the front, and off we went. After another ten minute stop on the way, we eventually arrived at the bus station, alarmed at whether we’d be forced to sit on the roof, or if the bus would even still be there. We raced from our transport to the bus, only to find it empty. 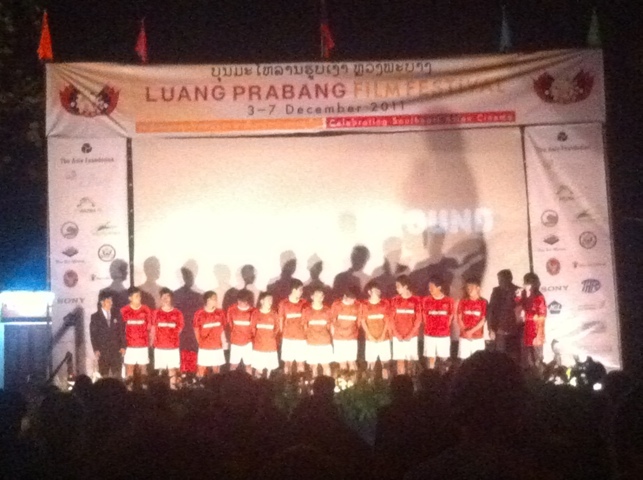 A sign on the front said Lurang Prabang 8:30pm. It seemed our 6pm pickup had been a little eager! We learnt our lesson, and will not be early again! During the night we trundled our way through the dark countryside, stopping for various toilet breaks at nameless shacks in equally anonymous towns. At one point I opened my bleary eyes to find we were in a place apparently from the eighties – and I wasn’t actually dreaming! 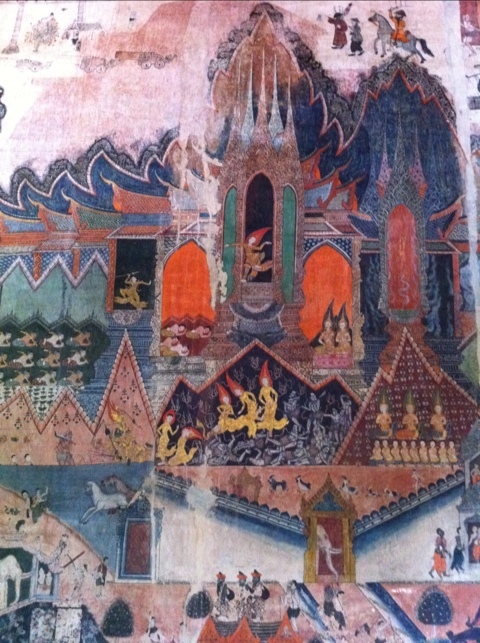 Everywhere one looked, there were bright white fluorescent strip lights in a strange Lao homage to bad taste and punk. They hung from lamp posts and took the place of floodlights illuminating temples. Every now and again we’d go past a lit up house, where I thought normal lightbulbs had been restored – only for us to see through the next window the distinct long white shape of glowing neon and have the 80s reconfirmed. In my dreamlike state, I half imagined seeing things to accompany the mood lighting: huge coloured hairstyles; ghetto blasters and graffiti; and worst of all, Margaret Thatcher in a shellsuit. 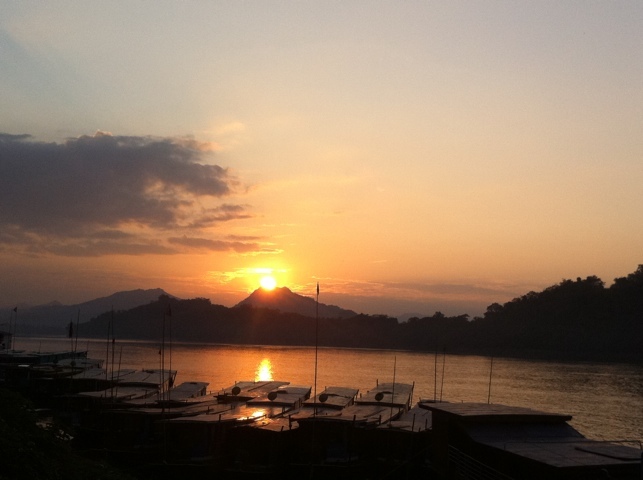 Fortunately we woke up to find ourselves at dawn in Luang Prabang and not stuck in a nightmare of three decades ago! 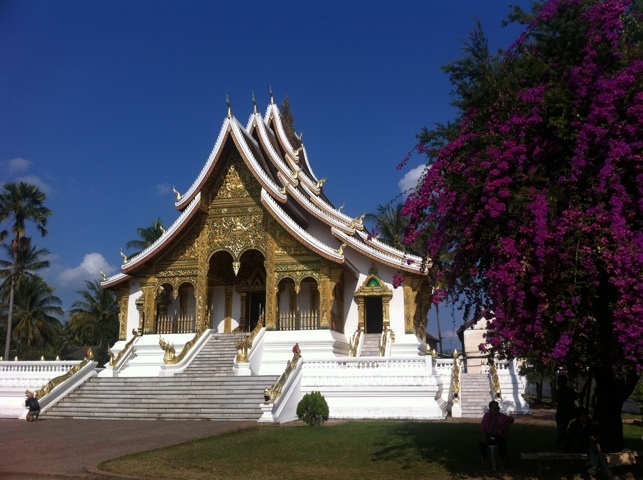 Another UNESCO world heritage site, Luang Prabang is famous for its historic mix of ageing French architecture and thirty temples, or Wats (the best being actually named ‘Wat That’). 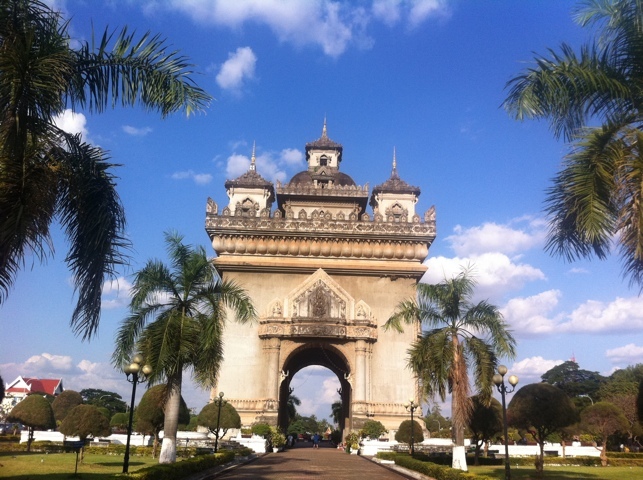 Like Vientiane, it sits on the banks of the Mekong – although without a huge flood plain in front, so the river runs right alongside the town, providing lots of spots for tranquil waterside eating and drinking. 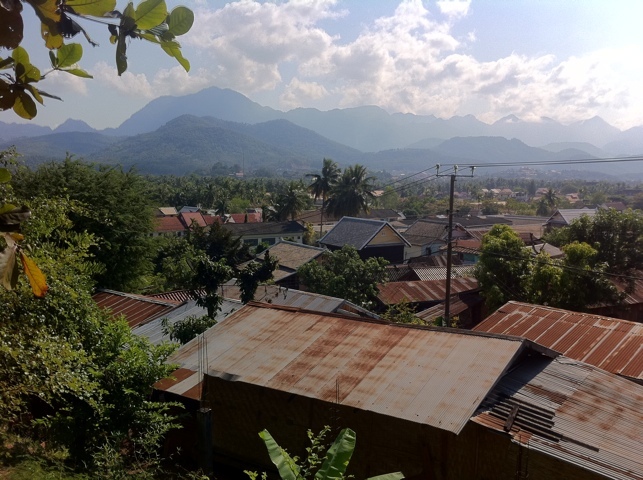 The climate in Laos has been overwhelmingly warm and sunny, hotter and more pleasant than Vietnam, without the repressive high humidity that we’ve experienced elsewhere. 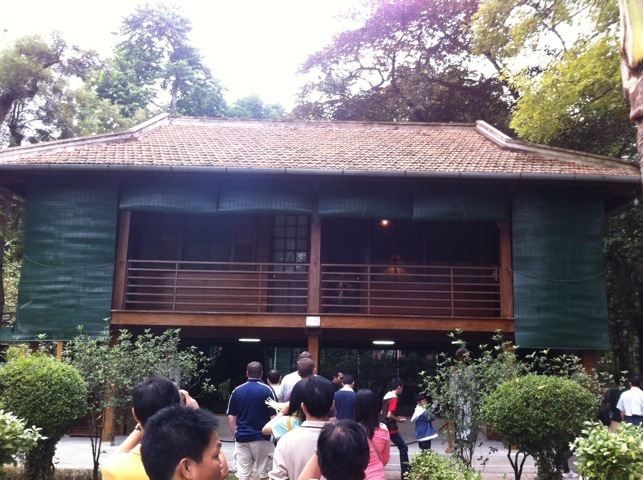 Above all, that means that the shade is a refreshingly cool sanctuary rather than more of the same sticky heat. We spent a good couple of days sampling the local culture – sights, food and of course drink – and soaking up the atmosphere. Some of the Wats really are incredible, with shining brightly coloured detail both inside and out. 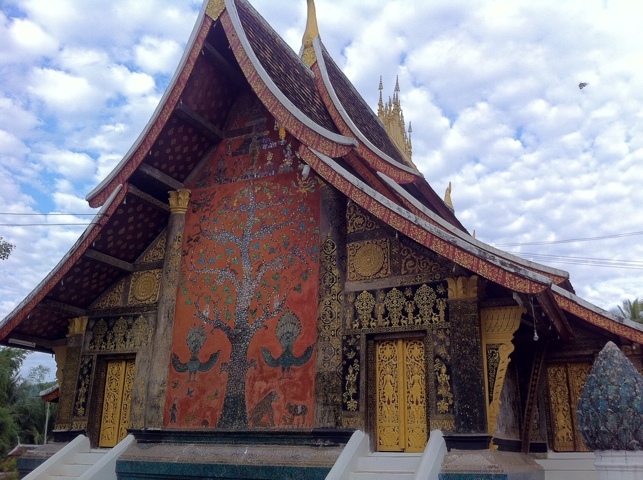 A lot use coloured pieces of mirrored glass to great effect, the most memorable a tree of life on the outside wall of the town’s best known monastery, Wat Xieng Thong, and the seam of bright red and green between the golden pillars at the City Palace. 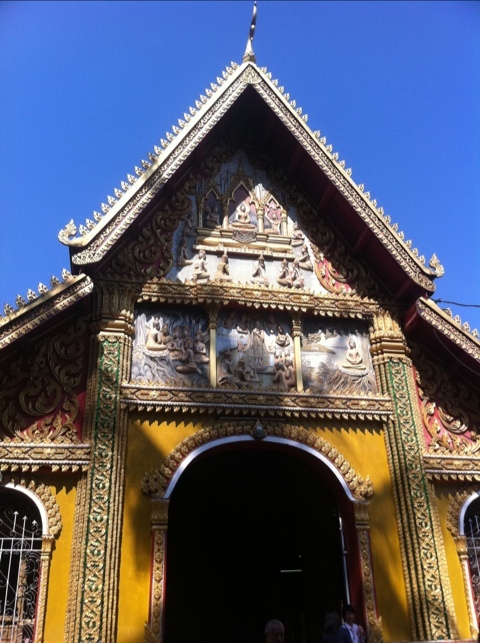 Wat Ho Pha Bang, at the palace, has the most amazing room of gold – every single surface in this huge space has been painted with gold leaf creating a truly heavenly effect. Some interiors are also decorated with age-old (and largely unrestored) murals, but it’s the exteriors that really stuck – set against the bright blue sky, the colours across the city were a fabulous blend of dazzling golds and gleaming reds and greens. 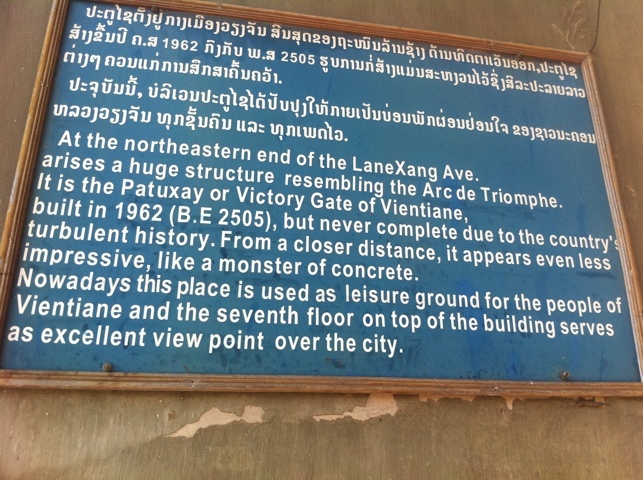 We climbed Phousi, the large hill in the middle of town, and from the temple at the top were treated to a vista over the surrounding area, as well as slightly incongruously, an acclaimed Buddha footprint. Having read about its existence somewhere on the hill, in true sacred relic fashion I began to see Buddhas’ footsteps everywhere. There was the strange dent in that limestone, which Laura was skeptical about, but I could definitely see something. Then came the impression in the cement, unquestionably a set of toe marks. Ok, maybe Buddhas marginally pre-date cement, but people have seen the Virgin Mary in their toast, right?! 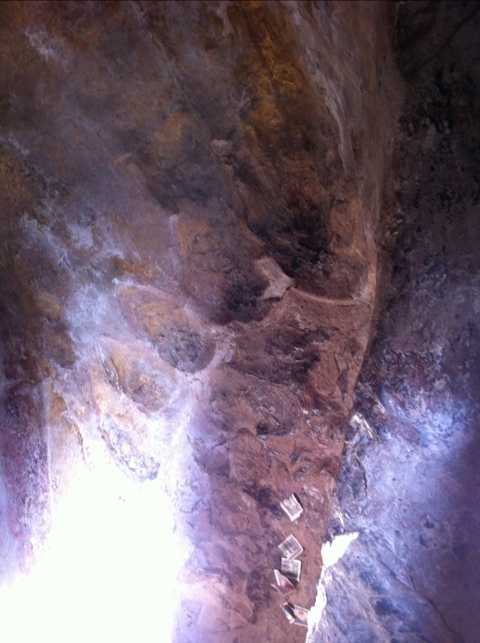 When we finally came to the footprint, a dinosaur-sized mark in the rock, we knew we’d come to the right place. Sign saying ‘Buddha Footprint’? Tick! Temple built over sacred relic to protect it from the weather? Certainly! Monk on standby nearby to smile and assist with donations? Must be it! Having succeeded in our quest, we retreated down the hill to soak up the sunset. While we were in town, Luang Prabang played host to its acclaimed South East Asian Film Festival, with free open air screenings in the town square. Having had some of the local rice whisky, Lao Lao, to fire up our imagination, we settled in to watch a preview of ‘On Safer Ground’, a Swedish film about the first Laos youth football team coming to the international youth games in Stockholm last year. Although slightly shaky at first, we were impressed by it and ended up gripped, following the team through their successes and penalty shootouts. To complement the football, As a more serious theme it also attempts to educate the viewer about the problem of unexploded ordinance, which as I mentioned before is a big issue in Laos. 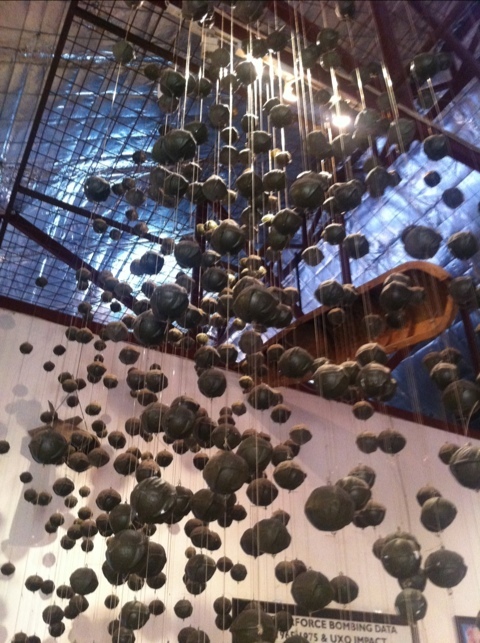 The activism culminated in heralding the arrival of the 2008 convention banning cluster munitions, a genuinely landmark action with many signatories, including the UK. 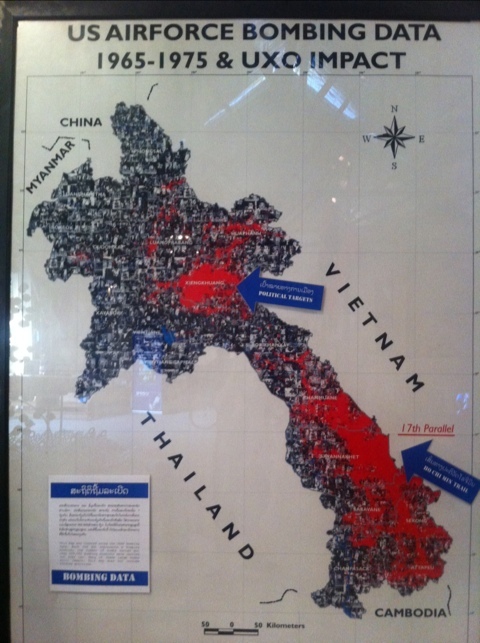 Poignantly for those across South East Asia affected by UXO, the treaty has however not been signed by the main culprit, the USA. After the closing credits there was a special guest appearance from the football team in their bright red kit, to rapturous applause from the audience. The film festival then welcomed their special guest to the stage, who was an odd choice given the UXO theme and the country’s history. Especially here, we weren’t expecting to hear “We welcome the US Ambassador!” In fairness to the individual, he looked embarrassed, and just shook a few hands before disappearing quietly. both how far Laos and the US have come in repairing their relationship after the unthinkable atrocities of the sixties and seventies, but also how far the US still has to go – not just on the issue of clearing up what it left behind, but also in there being real words of action for the Ambassador to be able to tell the crowd they were going to finally ban cluster bombs instead of embarrassed silence. We might think of these as grotesque legacies from the past, but the reality is that the source of the problem has still not been stemmed, with cluster bombs in use in very recent conflicts. The final 48 hours of the 2006 Israeli bombardment of Lebanon left more than 1,000,000 unexploded submunitions in the farmland and villages there according to the UN; the British used Cluster Bombs in Basra during the Iraqi Conflict in 2003; and the US used them extensively, including in Fullujah. In all three of these situations the objective was to reclaim the towns from militants so that civilians could return; in each they returned to a deadly harvest of explosives. Having spent much of our time hoping for the preservation of relics from the past, this is one legacy we do not want to be kept for the future. 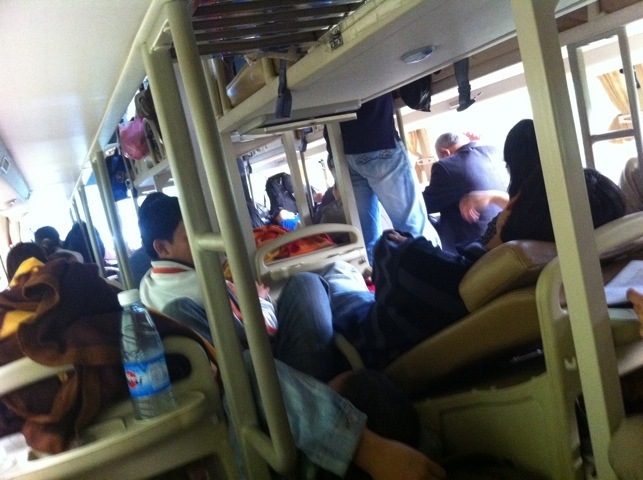 I’m writing from an epic bus journey, 24 hours from Hanoi, Vietnam to Vientiane, Laos. Laura and I have just had a tasty picnic lunch of baguettes filled with ham and actual cheese with flavour. My taste buds are still tingling from the sensation! Accompanied by stunning mountain panoramas and the great music of Electrelane, it’s gone a long way to break up the monotony of a long road trip. The bus we’re on is a modern sleeper, with three lines of bunk beds running down its length, some flat screen TVs playing Vietnamese dubbed Kung Fu movies, and a lot of sweaty passengers in the near-flat seats, and also on the isles between them. We’ve seen this trip dubbed ‘The bus journey from hell’ online, but in reality it’s been pretty good, after a slightly shaky start. We were picked up from our hotel by a minibus to take us and apparently 25 other tourists to the bus depot. Considering the minibus could seat 19, and we all had luggage a plenty, it was a bit of a squeeze! The obvious jokes about us being on the minibus all the way to Laos weren’t that appreciated by those standing in the isle, and we were pleased when rolled up at the city bus depot. Although not quite so manic on this sleeper bus, it’s still a squash for taller folks, with some bunks apparently built for dwarfs incongruously the place they were forced to sit by the driver’s shouting assistant. There’s a guy off to our right whose seat is so small that with his legs straightened out he was nearly sitting on the head rest! Fortunately our bunks are fine, even if the aforementioned shouting assistant has gone to sleep on the bit of corridor between us and occasionally elbows us as he stretches in his sleep. order to stamp us out (for a princely $1), and so had to return them. The guy called out each name, after which the corresponding person jumped to the front and did their best to look like their passport photo. Hats and sunglasses were removed, smiles were suppressed, and we tried to look as 2D as possible. It was more of a challenge for one girl who now had frizzy hair in contrast to her straight-haired photo; the guard even showed me her passport in jest as he refused to return it to her. Fortunately she had ID to vouch for herself, although at one moment it did seem he was going to seize that too! Laura and I managed to make it through unscathed – she actually looks quite like her photo, and it turns out that for me, the trick was to put on my best criminal pose, and then puff out my cheeks like a hamster – it would appear that I’ve lost weight since the snap was taken! All in all, we found Vietnam a little hard to get stuck into after India. Some of the places we went to were fascinating, and some of the things we saw and learnt heart-wrencing, particularly around the war. Unfortunately these moments of shock and awe were interspersed with a bitter taste from having both a taxi driver and a hostel try to con us in Hanoi. Perhaps we’ve also travelled too fast and not stopped long enough to let the qualities of the locals and their way of life really settle; our few days in Hoi An, in Ha Long Bay, and in Sa Pa were each enchanting in their own way – but not quite enough to make the whole. So with less than a month to go until Christmas, we find ourselves on a sleeper bus to sleepy Laos, where we hope to find a different pace with a relatively untouched way of life. As the French put it, “The Vietnamese plant rice, the Cambodians watch it grow, and the Lao listen to it grow”. We’ll let you know what it sounds like next time!